Thanks to a grant from UMB Bank, the project will consist of 10 or more sculpture of my Shtick People using different modes of transportation, including creative bikes and wheeled vehicles of all kinds. 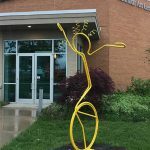 The sculptures will be placed along the St Clair County Metrolink alignment, in Belleville, Swansea and Shiloh. The first finished piece will be a unicyclist standing over 8 feet tall and bright yellow. The beauty of these pieces is the abstraction of the vehicle. Sometimes consisting of a simple circle of steel, I am purposely not incorporating all of the details of a real bike, for instance. The viewer will interpret the rest of the vehicle in their mind’s eye. I start with quick pen/ink sketches (doodles) turning the most promising ideas into machetes or small wire models 6 to 7 inches high. From that model, my master welder friend and I heat and bend steel tube or rod to mimic the model. Finally they steel is sandblasted and powder-coat painted. Other ideas that are be considered include a Shtick on a Bicycle, a Wind Machine, a Monster Bike and a Flying Bike. Many more will be developed as I meet with children in classrooms and hear ideas from young art appreciators. The final project will extend into 2018 allowing me to meet more youngsters and prepare all of the pieces by next year’s Art on the Square. I continue to make runners, musicians and other special order project. Another recent piece is the Family which will be installed in New Baden, Illinois in late May.